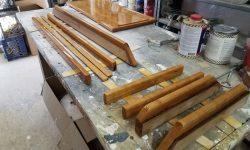 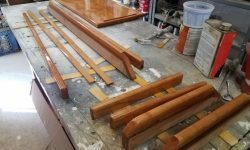 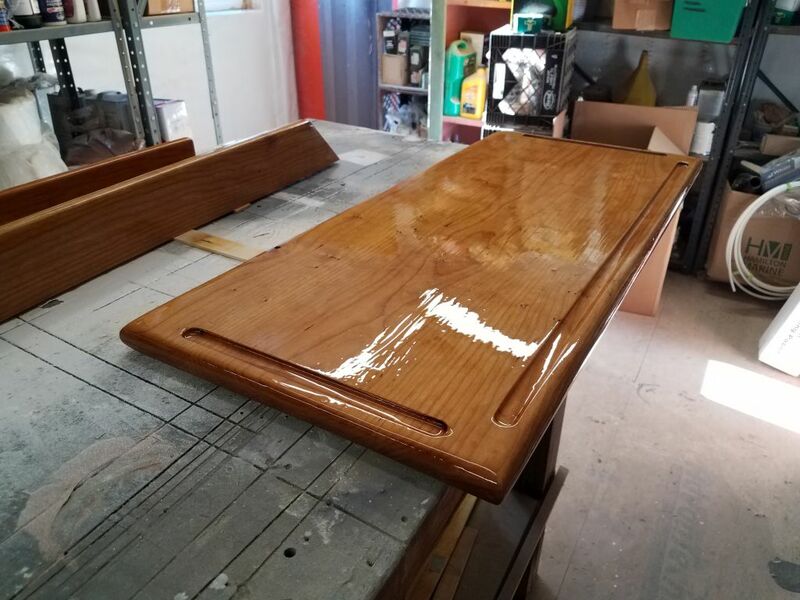 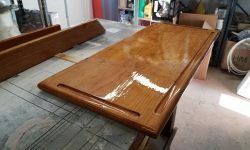 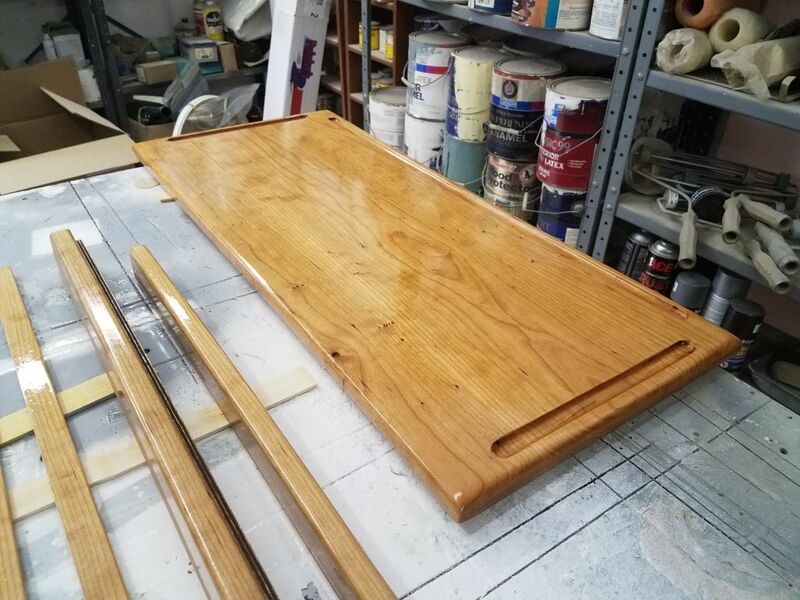 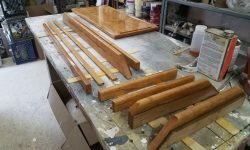 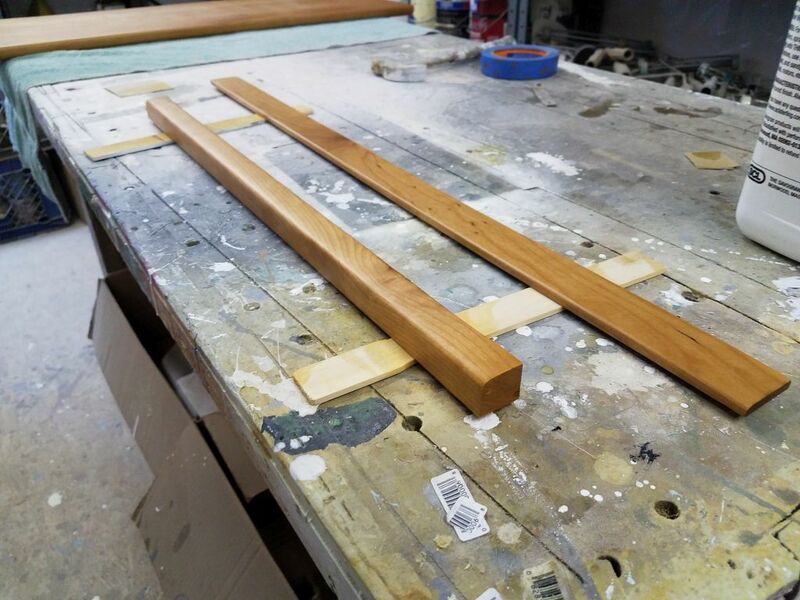 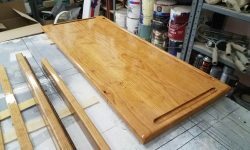 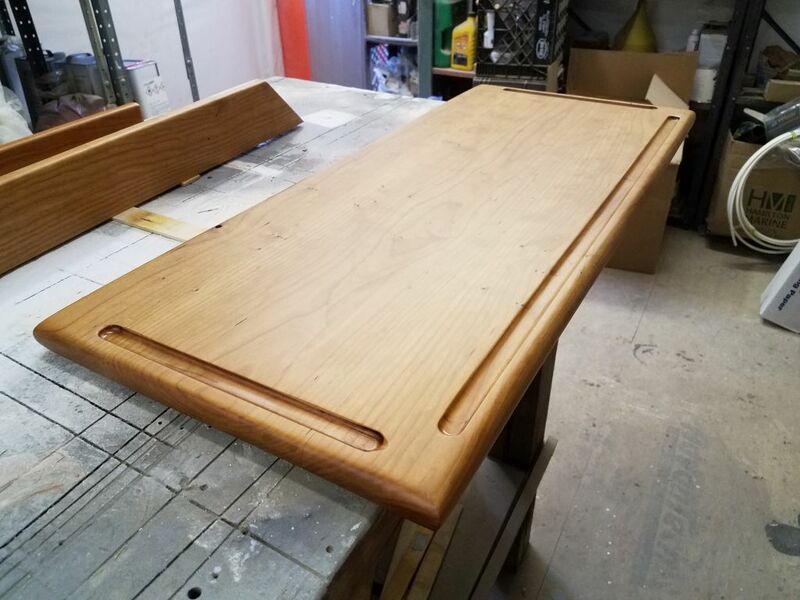 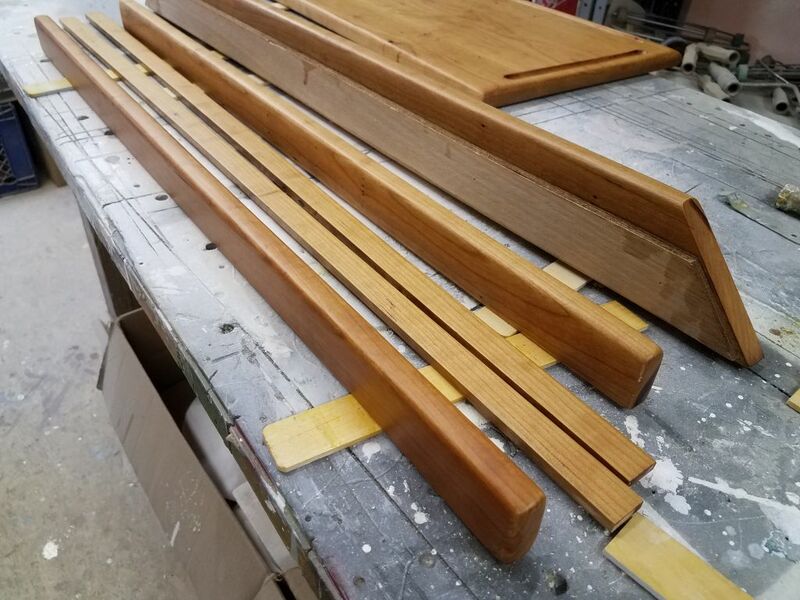 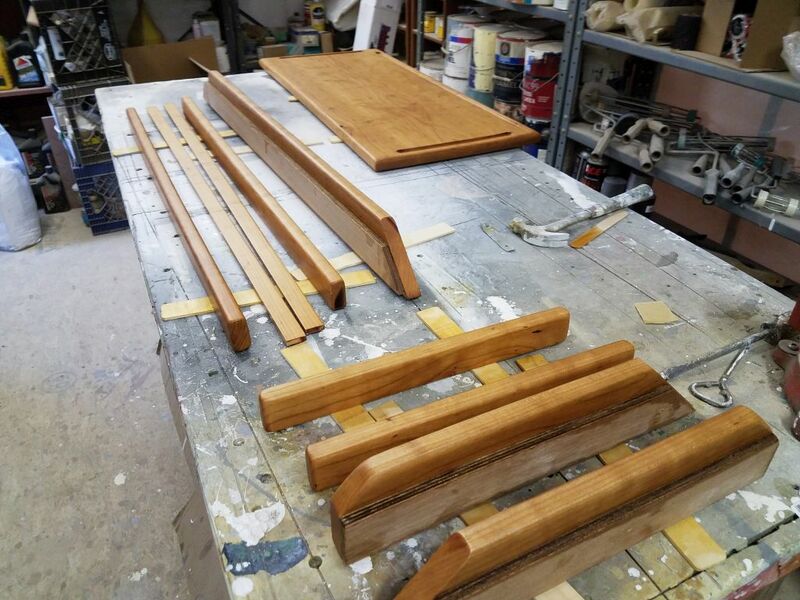 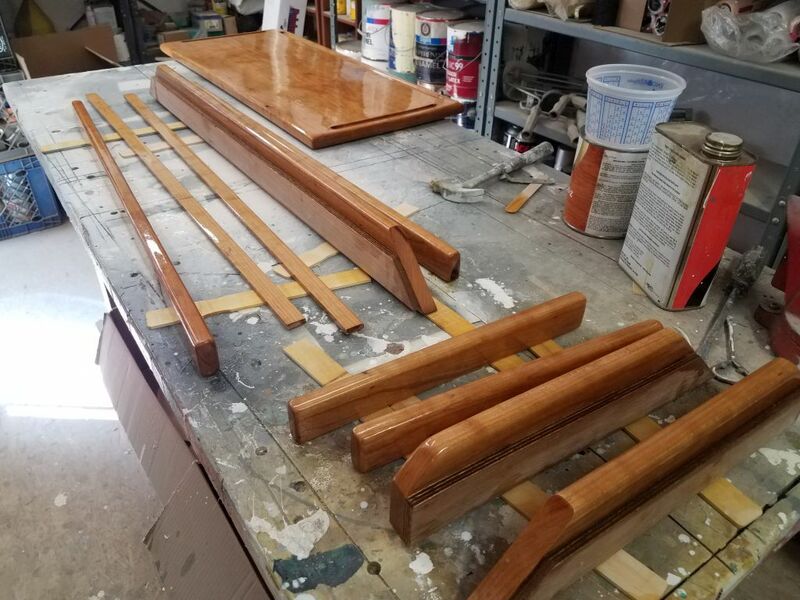 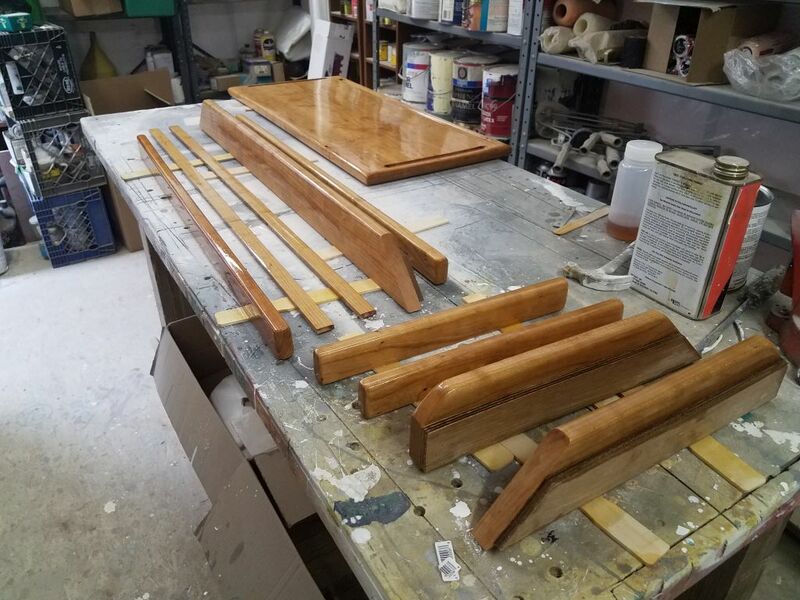 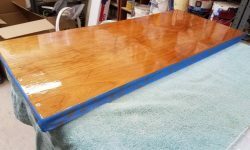 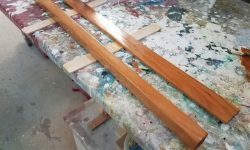 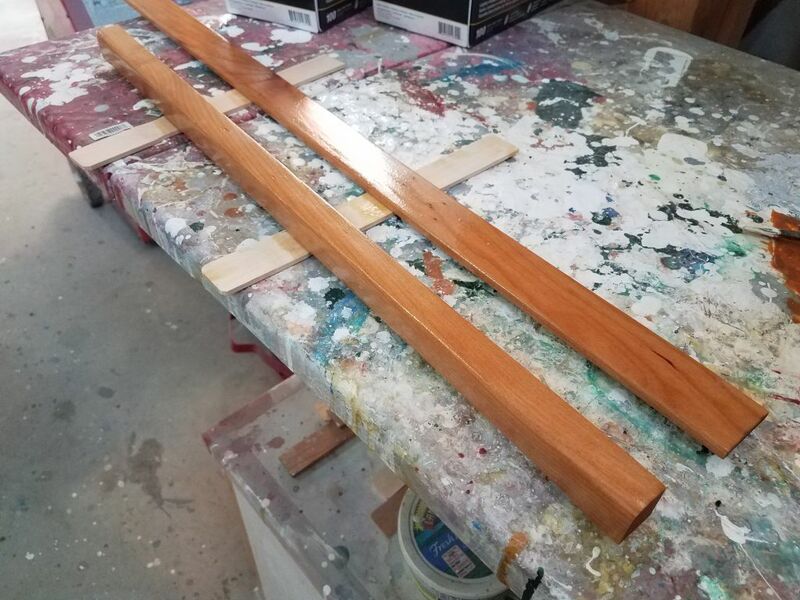 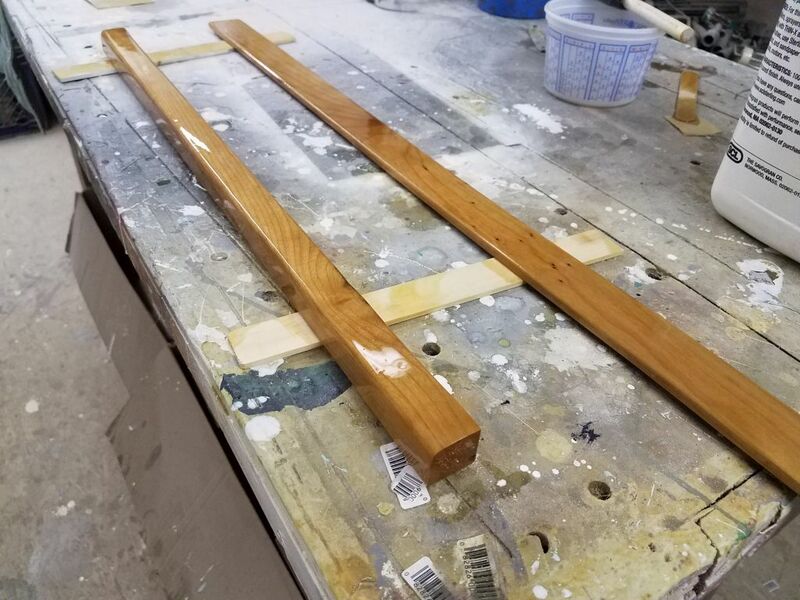 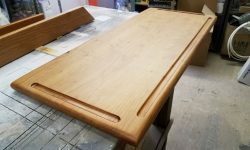 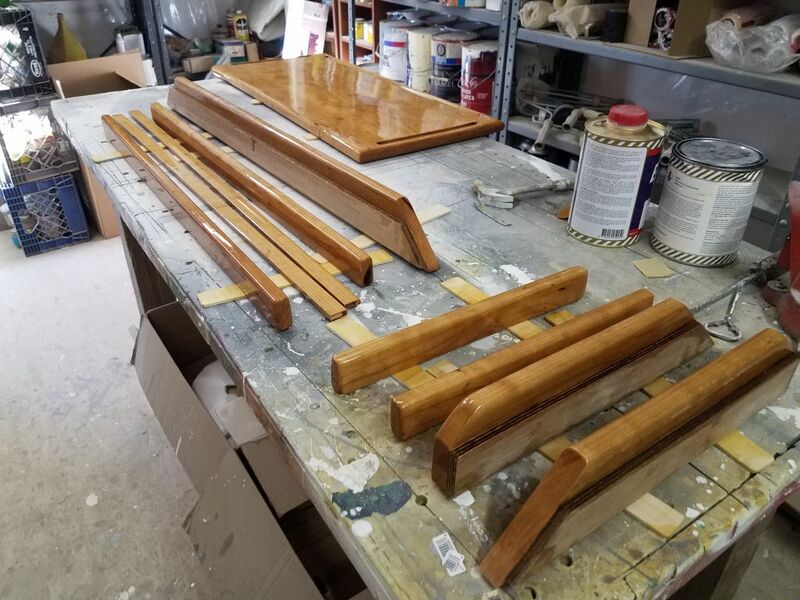 Over several days, I applied three base coats of gloss varnish and a final coat of rubbed-effect satin varnish to the table and related trim pieces. 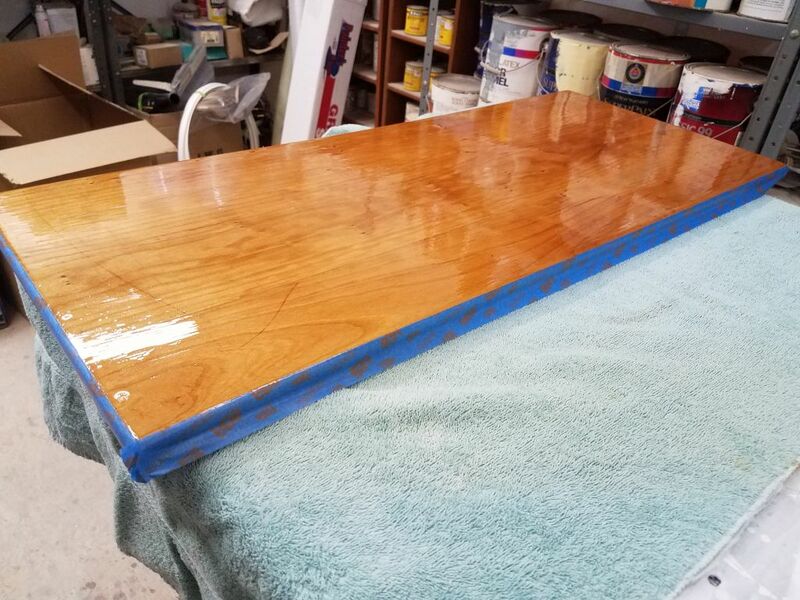 Later, I turned over the table top to expose the bottom side, where I’d already applied two base coats, and applied a coat of the satin varnish there as well. 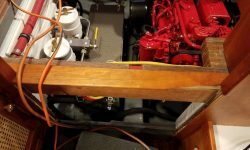 Meanwhile, I worked on another small project for the boat. 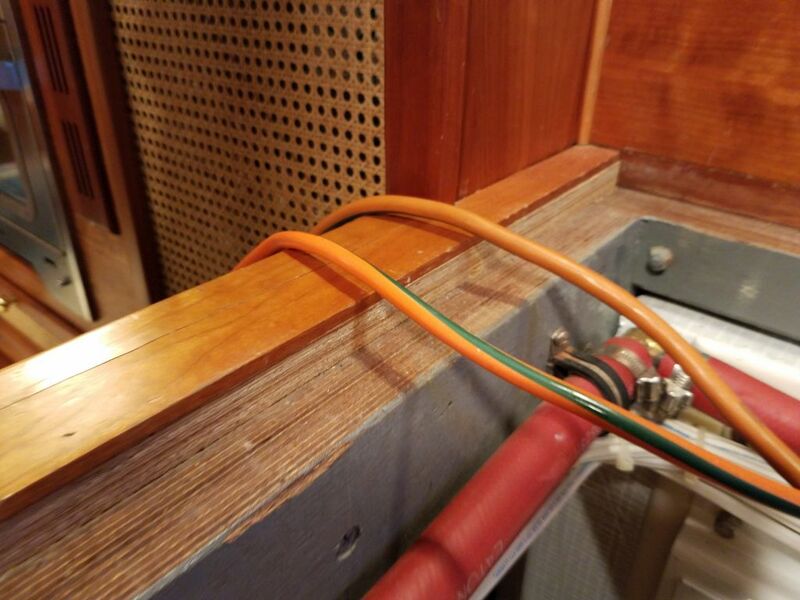 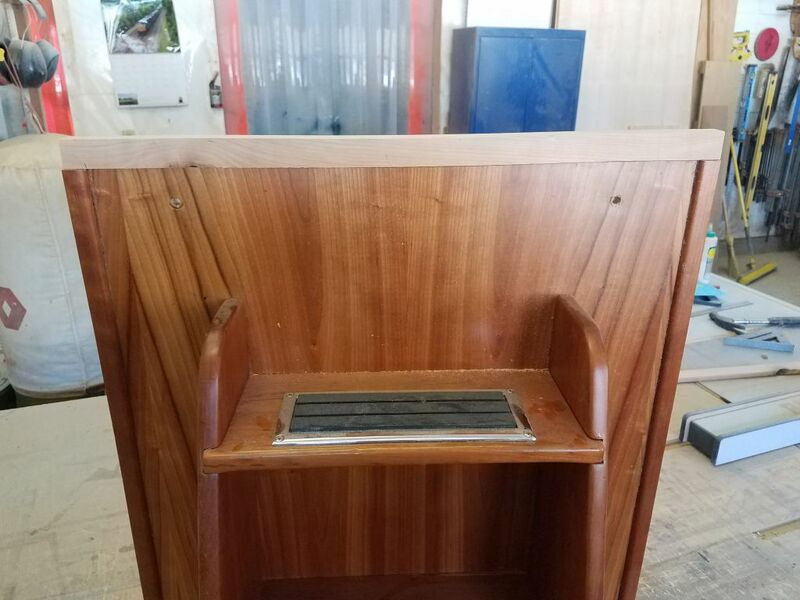 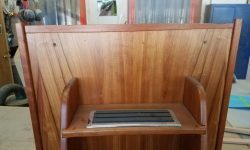 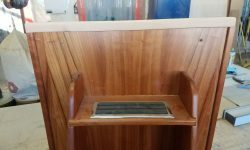 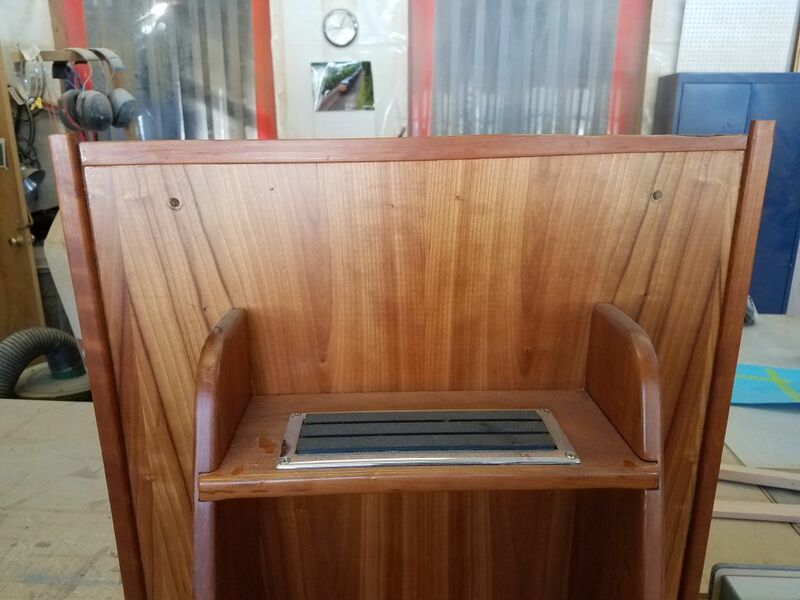 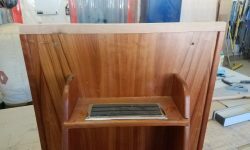 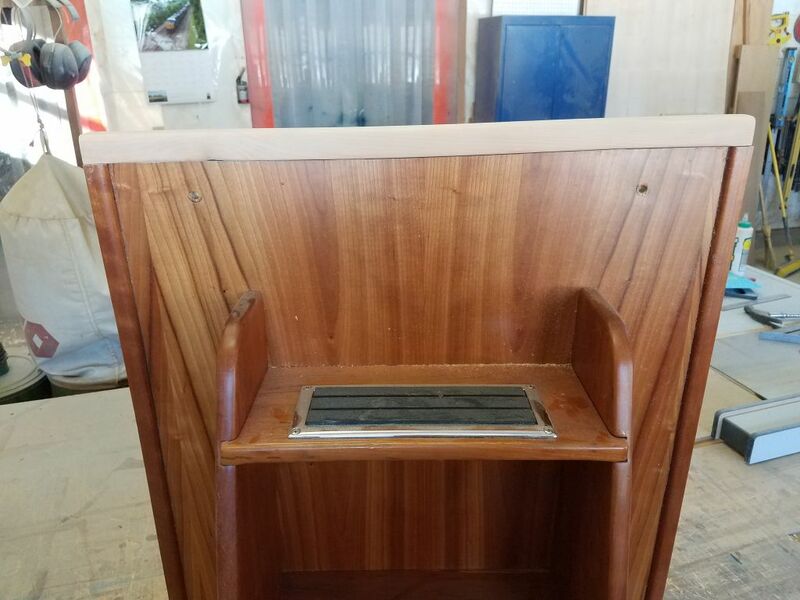 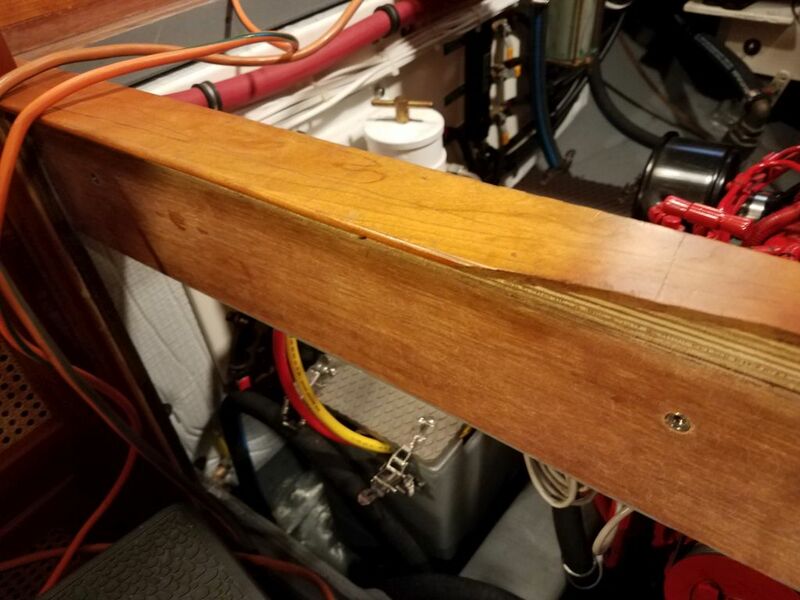 The original trim piece I’d built at the companionway between the pilothouse and main cabin had never worked well and was ill-conceived. 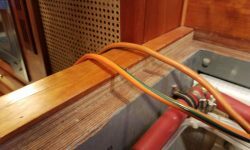 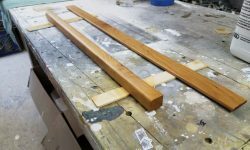 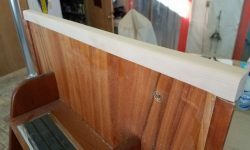 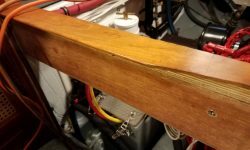 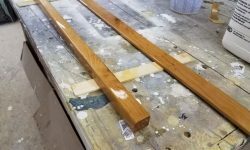 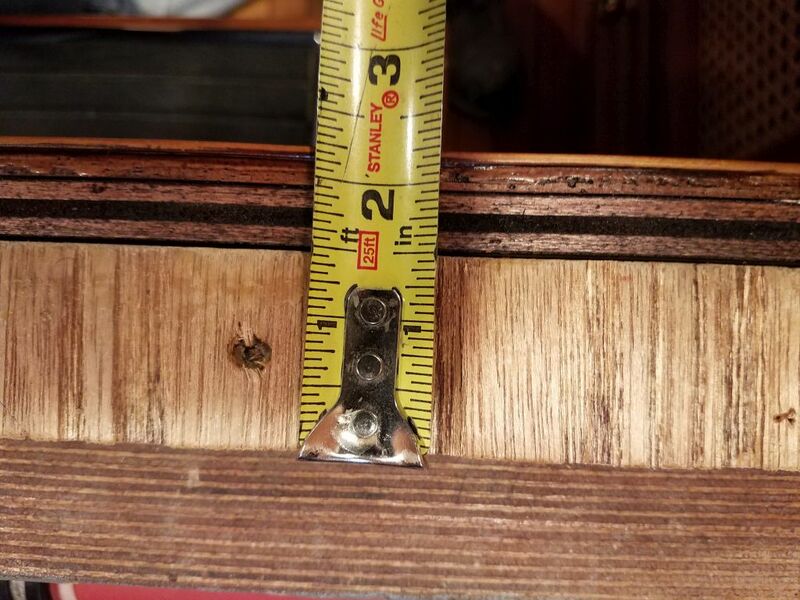 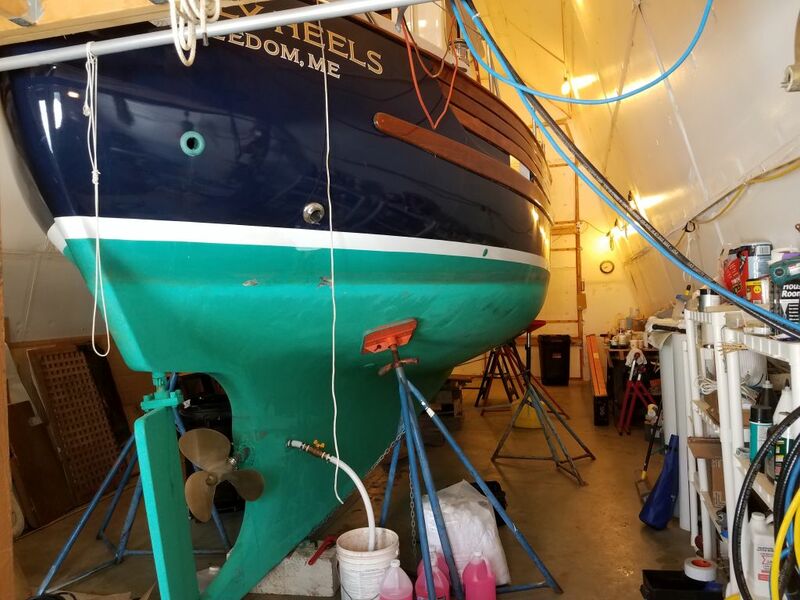 I’d built a simple transition that overlapped the top edge of the removable companionway ladder assembly, but the problem was that when the ladder was removed, the thin trim overhung too far, and this resulted in it cracking and breaking. 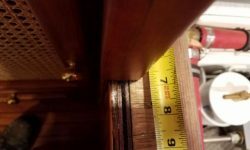 I removed the old trim piece and made some measurements for replacement trim. 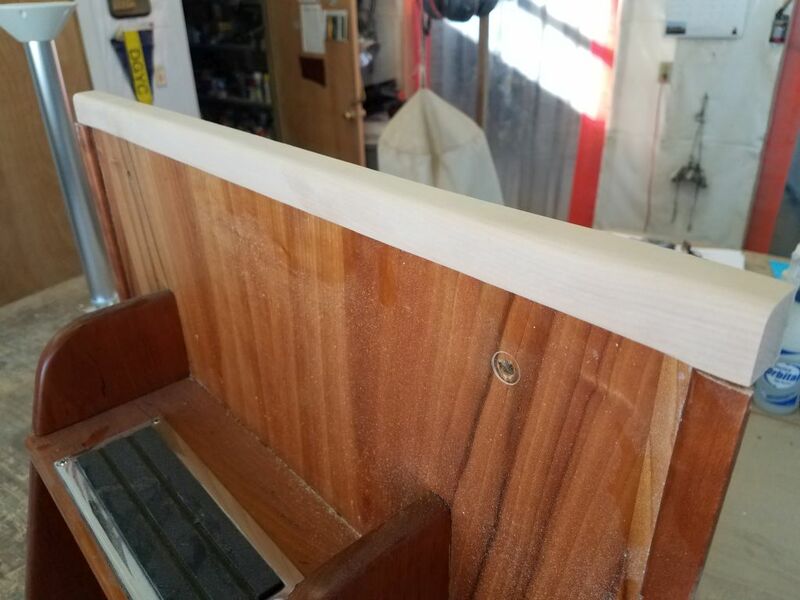 My initial idea had been to cut down the top edge of the ladder assembly a bit and mill a single piece of trim with a thicker, heavier overhang, but back at the shop this seemed overly complicated and unnecessary. 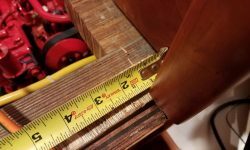 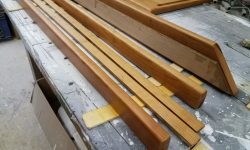 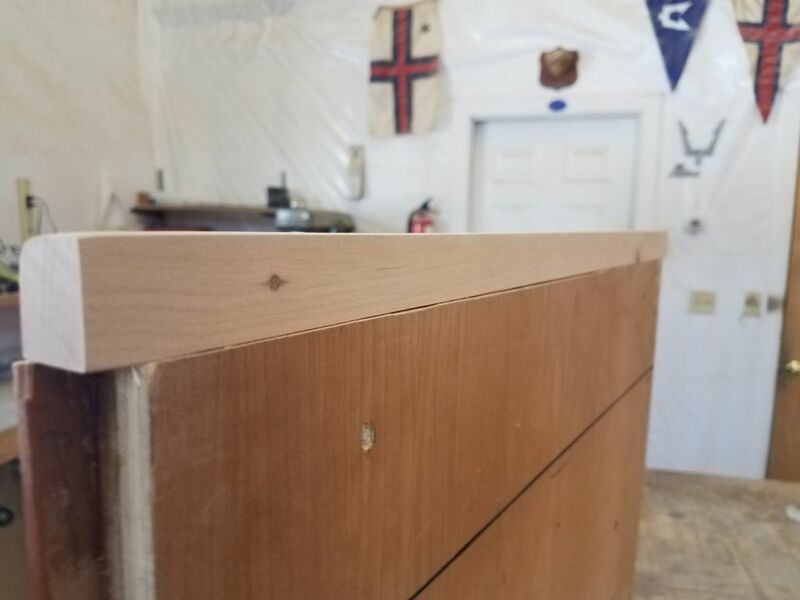 Instead, I milled a 1/4″ thick strip of cherry to the 1-1-2″ width required to cover the plywood subfloor in the pilothouse. 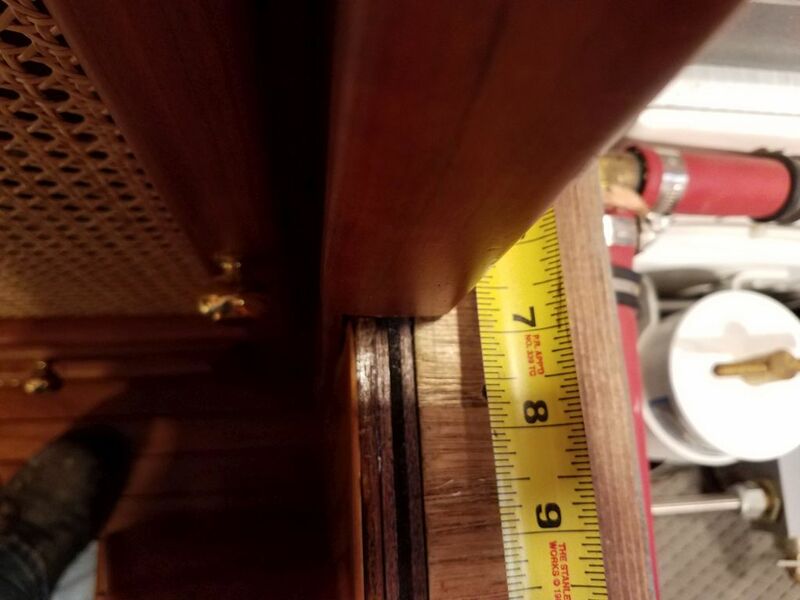 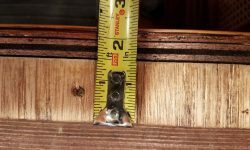 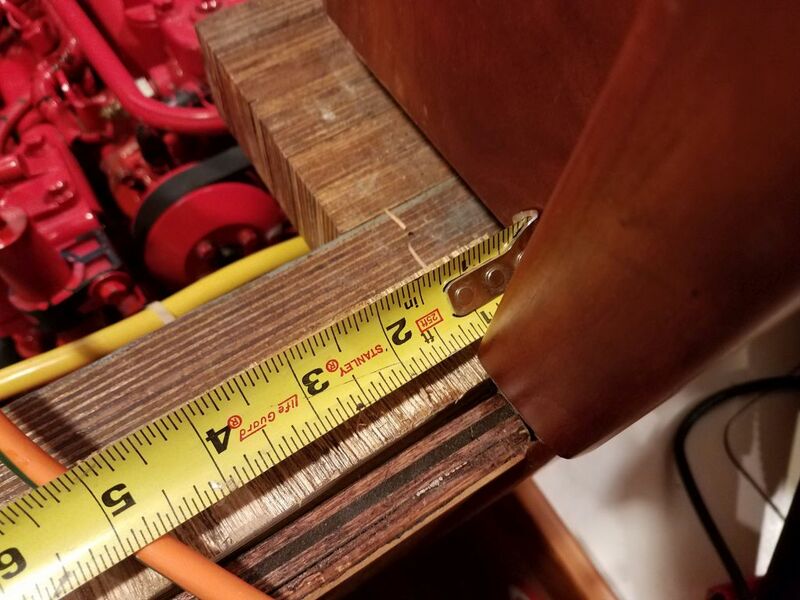 This trim would no longer overhang the top of the companionway ladder. 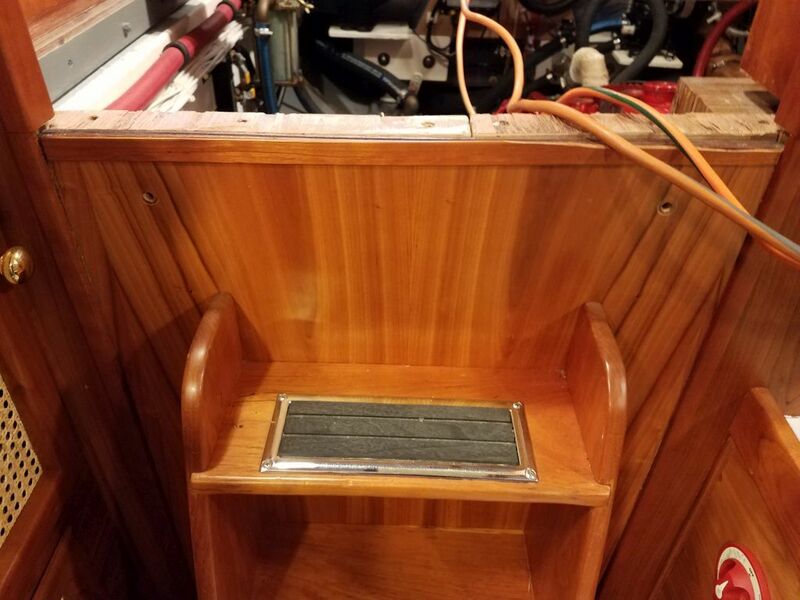 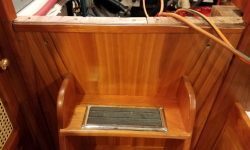 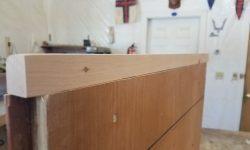 Instead, I trimmed the top edge of the plywood backing for the ladder, removing some additional trim that I’d originally installed there, and milled a solid, heavier piece of trim to cover the plywood end grain and meet up with the pilothouse floor level. 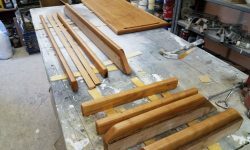 Over several days, I built up base coats of gloss varnish, then the final satin coat on these small trim pieces. 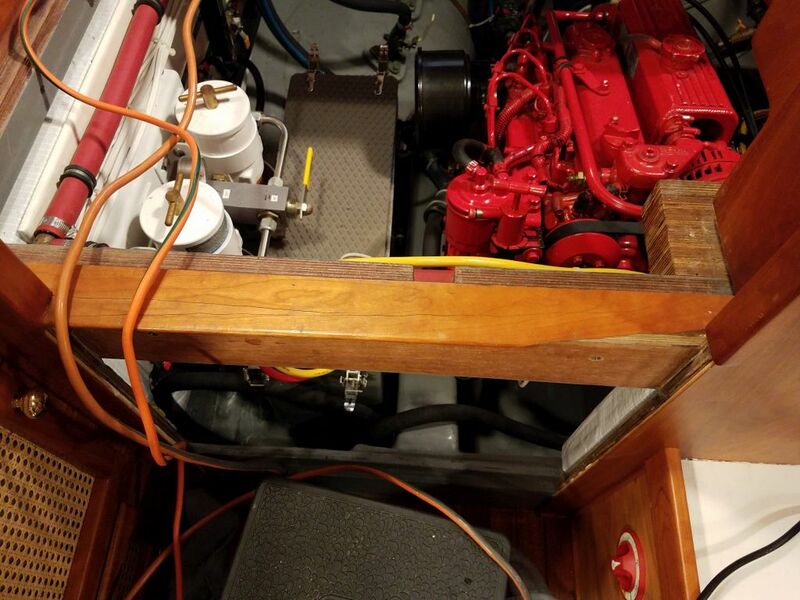 Final installation would come after a trial fit next time I was back at the boat.